Recently I faced this issue on my Pc. When I try to close opened tabs in firefox browser, My computer hangs and firefox become irresponsive and there is no way to get out of this problem until I restart my PC. If you’re facing similar issue with your firefox browser here in this post I will go through the solution to fix this issue. First I thought that the problem is with the version of the firefox which I’m using is causing that problem. But I’m wrong, I tried installing latest version as well as old version of firefox but still the problem continues. After doing little research on this I found that-firefox extension is causing this issue. I tried to remove all firfox addons but still no luck. I noticed that few users fixed this type of issues by creating new profile in firefox browser and I tried this, and you what it’s Worked! Create New Profile in Firefox-It’s Worked Now! Before creating a new profile we have to take backup of our firefox settings, cookies, passwords and other settings. For this I use and always recommend to use Mozbackup a free utility tool to backup your firefox profile. When you’re taking firefox profile backup make sure that you’re not going to take Firefox extension to do that just uncheck “Extension” option in the selection window. 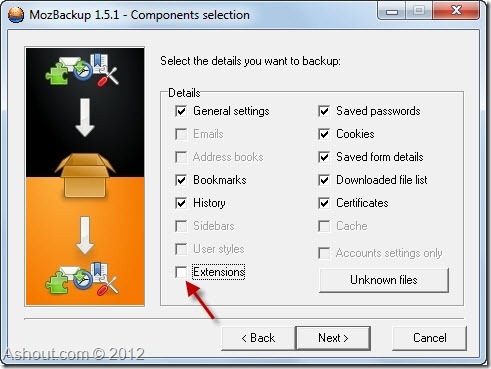 Now you will get full firefox backup expect Firefox extension/addons. Now we are going to create new profile in firefox to fix our issues. To do so, open Run prompt by pressing Win+R and type “firefox.exe -P” to open firefox profile creation window. Once you got profile creation window click on “Create Profile…” button and give any name you wish. Also, check the option saying “Don’t ask at startup” and click “Start firefox” button. Now we have created new profile in firfox, you can see that your firefox browser now looks like empty without having any previous settings. The next thing what we have to do is restore the firefox settings from the backup which we have taken from Mozbackup utility. To restore your firefox settings we have to close our opened firefox browser. Once you close the window, open the Mozbackup utility and you will see an option “Restore Profile” select it and choose your “Mozilla firefox” application to restore it, and click Next. In the next window you will see the profiles to which it has to restore the backup. Now select the new profile which you have created in previous step. Choose the backup file where you have located and click next. That’s it. Now we have restored all our previous settings to new profile. Just open the firefox you will see all your previous firefox settings expect firfox addon. Just go and install new copy of firefox addons. After doing this method firefox starts working fine for me, Hope it works you as well.